This is an excellent low cost automatic Seiko watch. I have always for over fifty years bought Seiko watches as they never let you down. This is my second automatic model so no need to worry about having to get new batteries fitted every five years or so. I have had it for about ten days now and it is keeping excellent time as have all my other Seiko watches. A great watch. Had a Seiko self-wind for over 10 years and was very happy with it, so when it eventually gave up the ghost bought this one - which is very similar. So far, equally pleased. Watch Shop website is very easy to use, delivery was very prompt and I particularly liked being able to specify my wrist size it fits perfectly! I do a fair amount of DIY and gardening and wanted a cheap watch which will withstand all the knocks, a splash of water and is easily cleaned - and this fits the bill. The quality is excellent and theres no fancy bits that stick out and potentially catch things. I had a black dial before and found it hard to read in the dark, but the white one on this watch is much better. Overall if you want a simple but smart day/date watch which you can put on your wrist and forget until you want to see the time of course! then with Seikos renowned reliability, at this price I dont think you could go far wrong. Bought watch as a present for my husband, lovely watch, good value for money and excellent service. Everything went smoothly, ordering,delivery quick,product excellent. Excellent product and service very reliable will use again and tell friends and family . A five star service as with the Gold Shop they were excellent to. The watches came in good condition thank you. Requested additional links for one of the watches purchased. Bought two of these watches as retirement gifts, they are lovely looking and at a brilliant price. Excellent quality Seiko with automatic movement. Also able to read the time in the dark, which is a nice feature. Fits very well on the wrist and keeps time accurately. A decent watch for smaller wrists about 40mm case width 12mm depth, silver dial with day and date and sweeping movement for seconds hand. It is Seiko 5 automatic so no need of a battery though has to be worn regularly so the movement generates the power to keep the watch ticking. Seiko KInetic watches can store the power for longer duration as compared to automatic one though are expensive. The hands and markers are silver so not much contrast to the silver background and there is some glow/luminosity to the hands and the markers, though they dont maintain the luminosity for longer duration not more than an hour or two even if it has been exposed to good light. A decent watch for smaller wrists with silver dial, day and date and costs only about 60ish and Seiko watches are known to keep good time. Very nice watch that has a smart looking crisp white face and smooth second hand. Keeps very accurate time for an automatic and holds power for long enough as well. I bought this watch for myself to serve as an everyday timepiece for work, and it certainly has not disappointed. I wanted something a little bit different, and less expensive than some others in my collection, and for what it was priced at in the January sale, I could not refuse.The watch box it is placed in looks very upmarket and presents the watch superbly. The case is small by todays standards, but sits nicely on a smaller wrist size. The simple but purposeful face is easily readable and reflects light beautifully.The date function is clear and precise, and has dual language capability. The second hand sweeps nicely and the bar-like hour markers gives a stylish, retro look. The luminosity of the markers is bright and quite pleasant, giving the watch a touch of class. The class is even more evident on the rear of the watch, although the exposed movement is a tad plain. The crown is attractively in-set, following the smooth lines of the case, but be aware that there is no hand winding or hacking facility you cannot halt the second hand when setting the time. The supplied strap has folded links and does feel flimsy, yet this can be solved by the purchase of another strap. I went with a black lizard skin Hirsch strap, which compliments the classic look of the watch. With regular wear, the watch keeps good time, but will be less accurate than the higher range of timepieces out there. However, if you are looking for a quality understated watch from a reputable brand, that combines practicality and good looks, this affordable workhorse automatic is for you. Excellent fuss free service. The watch arrived promptly and was wrapped beautifully. I cannot fault anything and would definitely use the site again. Watch was perfect. Extremely quick delivery. Outstanding service. An elegant watch which keeps good time and will never need a battery as it is self-winding. Comfortable to wear and easy to read the time even in the dark. All this at a reasonable price. Service rating : I was kept up to date about the delivery every step of the way. The watch arrived at Goldsmiths two days after I placed my order. The service in store was very helpful and courteous. Product : The watch is exactly what I expected. I fancied an automatic watch for a change as I appreciate the idea of a genuine mechanical movement. I have a few quartz watches but this watch is a great well known classic and fits my needs and price as a first automatic. The solid retro look appeals to me and the silver dial impresses with a simple classy appearance that goes well with business and casual attire. I intent to get a black leather strap to give it an alternative look, although the watch is equally suited with the metal bracelet. I expect it will last many years. Im really pleased with this watch. 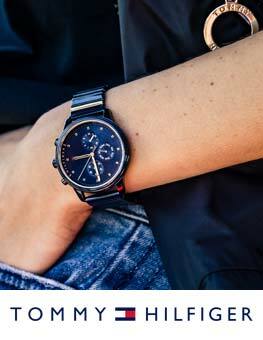 Not only does it have a stylish tasteful and smart look to it, its simply a quality watch. A proper watch that functions easily without any fuss or added expense attached to it. Excellent value for money. Fabulous company to deal with. 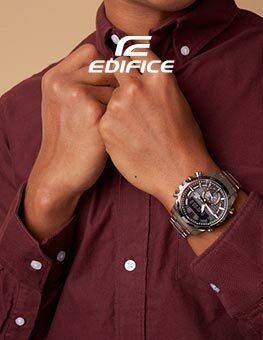 Great choice of watches....fast & reliable trustworthy Company. Really pleased, excellent watch at an excellent price. I was pleased as they bettered a lower price with their promise to try to match or better a price from competitors. Watch is every bit as good as I expected, complete with good instruction in plain English. I replaces a 40 year old digital Seiko which has started to have problems with the setting buttons. I am happy with my purchase and I bought this for my dad and it arrived on prescribed time. 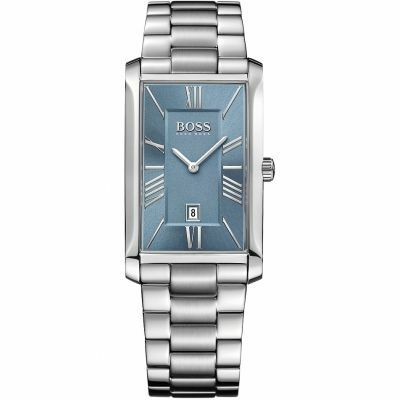 Casual or formal this watch compliments any outfit and keeps me on time for any appointments. The watch is very good, quite accurate with a very clear date and time. It did not like shock treatment however, and lost time when I used shears to cut a hedge. I have a small 7 inch wrist and although some links of the metal strap had been removed it fits too loosley and I am not sure whether it is possible from the type of construction to remove any more links. Lovely watch and unbeatable quality for the price. Bracelet is a little lightweight, but thats a small quibble. Suitable for ladies also, as face is not too large even on a very slim wrist. I looked everywhere for ladies automatic watches and they tend to be pricey and not my style. All I needed was a Seiko 5! Great service from placing the order to receiving the watch. The product was as expected and was accompanied by a £5 voucher to offset any 3rd party strap adjustments. If you were close to a Goldsmiths then free adjustments while you wait. The instructions are clear as to how to adjust the time, date and month French language option - although I did not read them until I realised the winder came out in two stages. One for the time and again for the date and month. Quality watch, style and feel. Ideal for my 80 year old father! Lovely watch keeps great time. Now I won,t forget wot day it is. This is an excellent Timepiece by Seiko. It is made entirely of stainless steel, and feels very solid indeed. The face also is silver and very easy to read. I might add that I also own one of the original Seiko 5 Series watches, which has an accuracy of about +/- 1 to 2 seconds /24 hours, which is superb timekeeping for an Automatic watch I can confirm that that my new watch is just as accurate...superb!! This is a superb watch and for the price is absolutely excellent value for money.If you like a classical 1960s style Automatic watch, purchase this...you will not be disappointed. I would also like to express my appreciation to Watch Shop for your excellent service...absolutely First Class, thank you. I had one of these watches years ago. I recently bought one for my son and decided to buy one for myself. Stylish. Compact, good value and no battery to run out! Very easy to order from a wide selection of manufactures. Selected a seiko 5 after reading reviews online. The watch is easy to use , just one crown which is easy to operate. The braclet was to big took watch to local Goldsmiths.Who agusted bracelet within five minutes .The watch is classic face and hands,easy to read in any light conditions. Will recommend Watchshop to anyone wanting to purchase a waTch. quality product, received in good order ,packaged to a high standard. I love this watch! This has to be the best value watch available at this price point ..... full stop. You get a great looking, stylish, versatile, retro-esque, vaguely Rolex datejust-ey stainless steel case and bracelet with good luminosity and an automatic movement for less than £60? Brilliant. My watch seems to run well within expected tolerances, losing around two seconds per day - mechanical watches are naturally less acurate than their quartz counterparts. The trade off is that it feels like a more alive, soulful peice of engineering on your wrist. The clear case back enables you to have a butchers at the workings inside- theres not loads on view but its handy to see the winding weight go round when your winding it by hand! You can see the regulator though and the case back can be opened so its possible to tweak the speed of the watch to make it more accurate - not something Im going to attempt at this stage! Any dislikes? Well the day and date change takes quite a long time starting around 10:30pm and only completing after 3:30am ish the day changes to French for a little while!. If youre sensible and in bed by then this wont be a problem! Also , I have small 6 1/2 inch wrists and the largish deployment clasp pokes into the strap giving it a slight kink. You cant feel it and the watch is very comfortable but it looks a little off. Not a deal breaker for me. The movement is Seikos entry level 7S26. You therefore cant adjust the seconds the hand keeps moving when the crown is pulled out and theres no way to manually wind the watch - you have to swing it around to get it going again should it stop its meant to go for about 40 hours when fully wound. 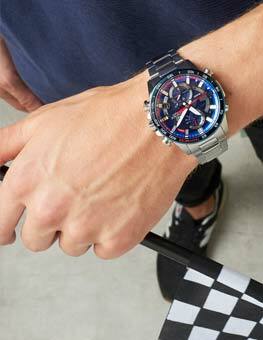 I think you will love this watch and can recommend it wholeheartedly - also props to Watchshops speedy and efficient service. The watch and bracelet looked and felt very nice. The weight and depth of the watch were a little more than I expected but I quickly got used to this. The bracelet did need adjusting which a local key shop was able to do. They also showed me how to do it myself which wasnt too difficult. For me, not being near one of their recommended jewelers, it would have been useful to have included how to make this adjustment in the watch manual itself. To set the correct time with the day and date is fairly straightforward but necessary to follow the instructions very exactly. Ive been wearing the watch a good week now and it has kept perfect time without needing further adjustment. I anticipate good use from this watch. Excellent, straightforward, easy to set up, clever automatic self winding mechanism and very stylish watch. Looks really nice. Its a Christmas present so have not taken it out of its box. took three days to arrive with post office. Staff very good and helpful. Looks a million dollars! purchased this watch to add to my collection after reading a review on it. The quality of the watch really matches some of the big swiss brands. runs perfect! I am very happy with this Seiko watch, it is exactly what I wanted. It is very comfortable on the wrist and looks really nice. The only downside to this purchase was the lack of communication from Watchshop. I did not receive an email either when the watch was dispatched as promised at time of order confirmation, or when the watch arrived at my local Goldsmiths ready for collection. After a few days of waiting I contacted customer services and was told that my watch was waiting in store. Watchshop have since managed to send me TWO emails, reminding me that I havent written a review. Here it is. The watch arrived promptly, well packed and in good order. However the day of the week indicater is not in English, so disappointing. Very good watch, especially for the low cost. Really impressive customer service at goldsmiths too. I bought this as a gift and my friend was totally delighted. As, so was I, it was a wonderful buy giving the discount. We always set a maximum spend and this came well within that criteria. I love the look of the watch. The strap and face are nice, the see-through back of the watch is pretty cool. 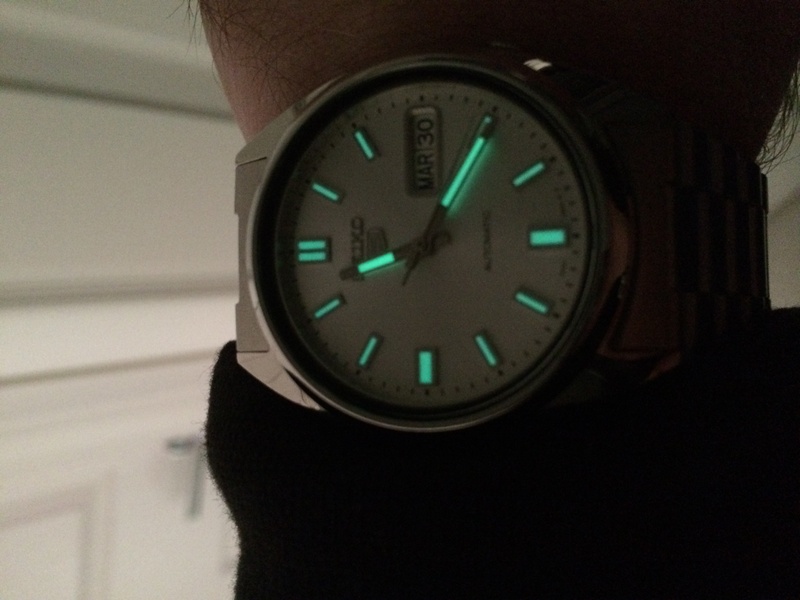 The dial is clear and easy to read with glow in the dark 5 minute markers. Only thing Id change would be the size and weight. Id like it to have been a little larger. The watch was really great as its design and look was awesome and fit right in my wrist. The watch was as I had expected for a great price. The Seiko 5 automatic is probably the standout Seiko watch of the last 50 years, with millions sold around the world it has set a standard for affordable timekeeping that is yet to be surpassed. An extremely robust and well designed fully automatic 21 jewel movement assembled by robot manufacture, this watch does not require batteries, nor does it rely on a capacitor to store energy. If you move, it winds itself. It is a fully mechanical watch and a thing of beauty to stare at through the glass case back installed originally by Seiko to thwart the many forgers of this timepiece - in itself a testament to the reputation of the watch - its not only Rolex that gets copied! The 1960s design is classic, and its clean, understated lines and proportions define it as the opposite of a statement watch. The recessed crown at 4 o clock is its signature and the smooth mechanical sweep of the second hand shows immediately that this is no cheaply produced quartz timepiece. The fact that this watch is mechanical does mean that there can be some variation in accuracy to +/- 25 seconds per day. Over many years of owning Seiko 5s, I have never had to resort to adjusting the meter of the movement, which, as it is mechanical, is perfectly possible. As one of the small number of manufacturers still to produce everything in-house, you can be sure of the quality of a Seiko automatic. Still, if pinpoint accuracy is important to you, buy a digital or look at your phone. But if you choose a Seiko 5, youre buying into something quite different. Received my watch really quickly and must say am delighted with it. A stylish watch for everyday use. This is a direct replacement - the first was lost in airport security. Just as good value and this one is keeping better time than the first, which only gained a minute a week and was well within specification. Couldnt find anything to match the value. Delivered as stated. An excellent watch. I had a similar model some time ago but it eventually failed to wind properly so I and am very glad to have been able to replace it. What I particularly like is the absence of any winding know, a protrusion which easily scuffs my shirt sleeve. Also the dial is light coloured and the hands are illuminated. The watch is a top brand seiko at very good prices competed with other jewellers a classic look which is always in fashion , well presented for any one buying a gift that looks a lot more money than what it cost ,fits well plenty of adjustment ,a very good looking watch. Looks solid and well made. The length of the metal strap was easy to adjust. Chunky without being too large or heavy. Looks good. This is a true classic seiko at a bargain price. I love the simplicity of design , and quality of product. My only concern was that the bracelet was too loose for my thin wrists, however a local Jeweler kindly adjusted the strap and it now feels secureno charge!! He did say he would remove links if need be. as well I like the skeleton view of inner workings at the rear. I also like the fact that it does not require batteries but presumable is activated by movement. For once a great internet purchase. Everything about my new watch is first class. The set-up procedure was childs play even I could do it! and took only a few minutes. The watch looks really good and has had good comments from my family, friends and myself. It keeps excellent time, looks great, is very comfortable. Many people think that it was worth a great deal more money than I paid for it. All in all an excellent buy and I shall certainly purchase another Seiko watch but this time as a gift. Love it, is grate nice siza adjustable to fit my fatherinlaw a simple watch he going to like it . Amazon had this Seiko 5 a little cheaper but I went for the click and collect option because Watch Shop offer free strap adjustment on click and collect and my last watch, also with a metal bracelet, was far too loose. So I went to Westfields, W London and collected it from Goldsmiths. A nice young man there offered unpromprted to alter the strap but actually it was perfect out of the box. Then I had a pleasant lunch before getting on with the rest of the day. A much better experience than ordering online and having to wait in to sign for the package then finding the strap wrong. 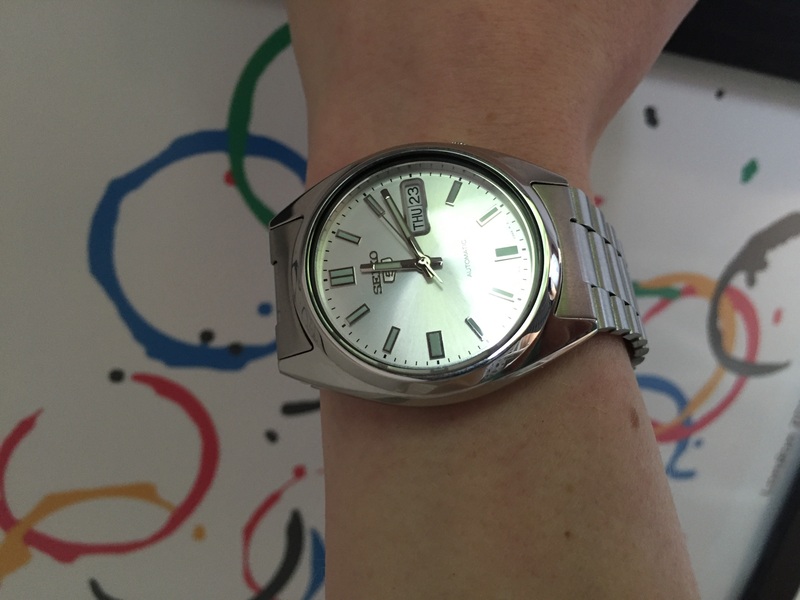 I wanted an automatic watch in my ever growing collection and a bit of research revealed that the Seiko 5 range were a great buy for the money. The movement in the 5 comes from a rich heritage of reliable watches making it a popular choice for many. After owning it for a couple of weeks I am really pleased with it. The look and quality of the watch is superb, its really comfortable to wear and with its highly polished case and visible movement parts it looks much more expensive than it is. My favourite visual feature is the lume hands and hour markers which really bring it to life in low light. I wanted to test the time keeping abilities so used a website to set the exact time the second hand CAN be stopped for precise setting despite what others have reported and it keeps time TO THE SECOND over a 24 hour period which far exceeded my expectations of a non quartz watch. Well done Seiko! All in this is a great watch for the money which I think you would struggle to beat. Watch was as advertised, simple instructions for setting time/date. Apart from that I would highly recommend this watch, only problem I can see is the colour to buy! Fabulous watch. Although it did confuse me by having two languages on for the day. But you there eventually. This is a beautiful piece of machinery. You actually get to see the internal mechanism as it oscillates and powers the watch cos its got a see through back cover. This is a proper old school watch ie not battery operated. I love the fact that you can still buy an affordable precision watch that carries an established brand name. Though it has a metal bracelet It is not bogus nor heavy yet it has the presence to quietly state not cheap. The watch has a day date and month feature that seems to a bit more complex than I would like so I shall go back to manual shortly too work that out but other than that everything about this watch is just right. To summarise I am extremely pleased with my purchase and though it is still early days - so far so good. What a fabulous watch for the price.This is an a Christmas present for a friend in the Caribbean. He always wore Seiko so when I saw this watch at such good value I had to buy it. Excellent service really pleased with delivery and the watch. I would recommend your company to my friends and would be happy to be a returning customer in the future. Having had Seiko watches since I was 21, this latest watch is another special example of the quality that goes into the Seiko products. This watch has an automatic winder which gets rid of the need to keep getting the battery changed at fairly infrequent times. I love the stainless steel watch and strap as these will retain their colour permantly. 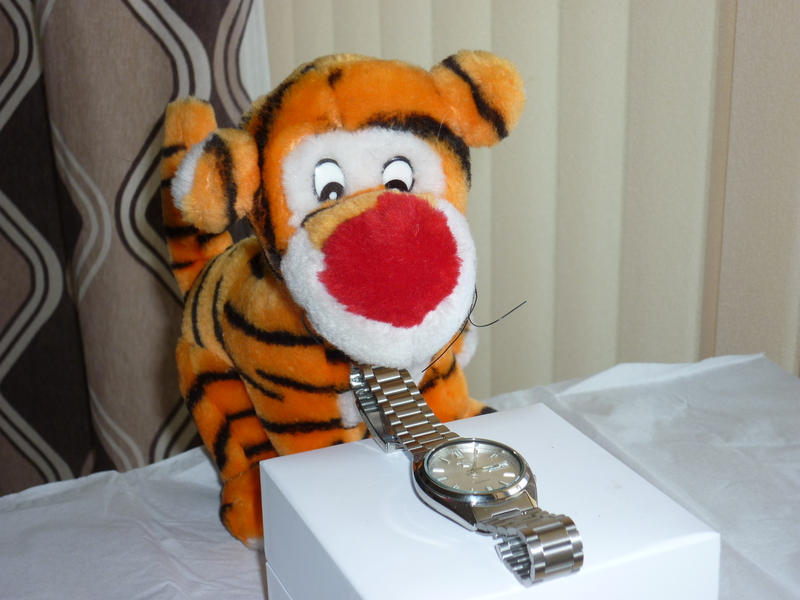 The choice of face colours allowed me to have a silver one, as I do not like the black or the white face colours.This might not be a most expensive watch in price but it will serve a retired person very well. Excellent watch to replace a Seiko that I had used since the 1980s. Great looks but it is the Seiko quality that makes it special. The watch was chosen because I have had the same model for 20 years and wanted a change but I chose the same again because they are reliable and good to look at and excellent value for money. The watch is made by one of the best names, it is classy without being too fussy. It was a matter of choice between two colours - Blue and silver as the blue was too dark, I chose the Silver face that is. Being an Automatic watch, it winds up by your movements ofyour wrist and arm. So there are no batteries to change, or go to recycling. It has the benefit of seeing the time, day and date. Because of the silver face, these show up with great clarity, no squinting! The best thing about it, it really does look great on my wrist! Arrived in time for Christmas. Looks like the picture on the website and came in a white box. The watch was allready working when I opened the box so I hope the battery will last! 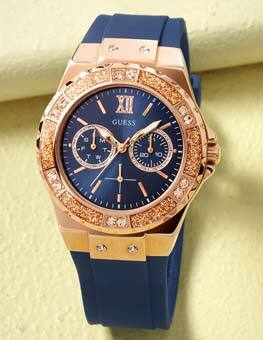 This is a lovely watch, hope my husband loves it, its a Christmas present!!!!!!!!!! The watch was supplied with a very small strap with a maximum setting between 20 and 21cms. If fastened uncomfortably tightly it could just about be fitted. A local Seiko jeweller obtained extra links having offered them to us at £5 each and for a total charge of £18, has fitted two links to the bracelet and now, a week or so since we took delivery, I can at last comfortably wear the watch. The watch looks very smart and now that I can wear it throughout the day appears to keep good time. However, it is very strange that you as a specialist watch outlet supply gents watches with such a small wrist size bracelet. Bought this watch for my husband, when it arrived it was better than I imagined, the quality is excellent, its very solid and very classic. This watch is amazing value for just over £59. The bracelet is a good size and can easily be made smaller. There is nothing to not like with this watch. The only negative was choosing the face colour! I have got this for a christmas stocking filler for my husband.I think it is excellent value for the price. A very nice watch light, you are able to see the time in the dark and not to bulky, you are able to read the day and date, ordered on Thursday and received Saturday over all pleasesed with my perches I would recommend. Excellent Service, delivery was quick, and I am very pleased with my Seiko. Thank you watch shop! The watch Seiko SNX73 was an excellent purchase as it was clear and has kept perfect time since purchased. however if you need split second accuracy may not for you you will need to adjust occasionally but it is a nice looking watch reliable and no batteries required. Bought watch for son because I know i can rely on the seiko name it is water resistant, and automatic no need to wind it also comes with a two year warranty . My son was always looking at watches on ebay but I said no i will buy you a watch but the one that I know will last a long time and will not break straight away he wears it all the time and he likes the watch a lot and I have no worries because of the quality in the name of the watch. My husband loves the watch. Illuminates at night so easy to see time. Great purchase.. The watch is great since its a present for my father for this coming Farhers day. The straps are great as they maintain that vintage look capping it up with the silver colour. All in all its a product I would highly anyone who wants value for his money. Excellent service very pleased with the watch which was a replacement for an older version. Simply a fantastic and classy looking timepiece. When it arrived in the post it exceeded my expectations and I just can believe the quality of it for such a low price tag. It almost feels too nice to wear! Bought as a surprise present. Wonderful present and excellent for the price paid. Really pleased. I bought my first SEIKO watch some forty years ago and it lasted for years, until my father borrowed it one day and had an accident with it. I loved that watch, it was just brilliant and self-winders were a bit of a novelty in those days. Since then, I have been given watches as presents, but not even the ROLEX I received on my 40th birthday from a two-faced employer imbued me with the same feeling. 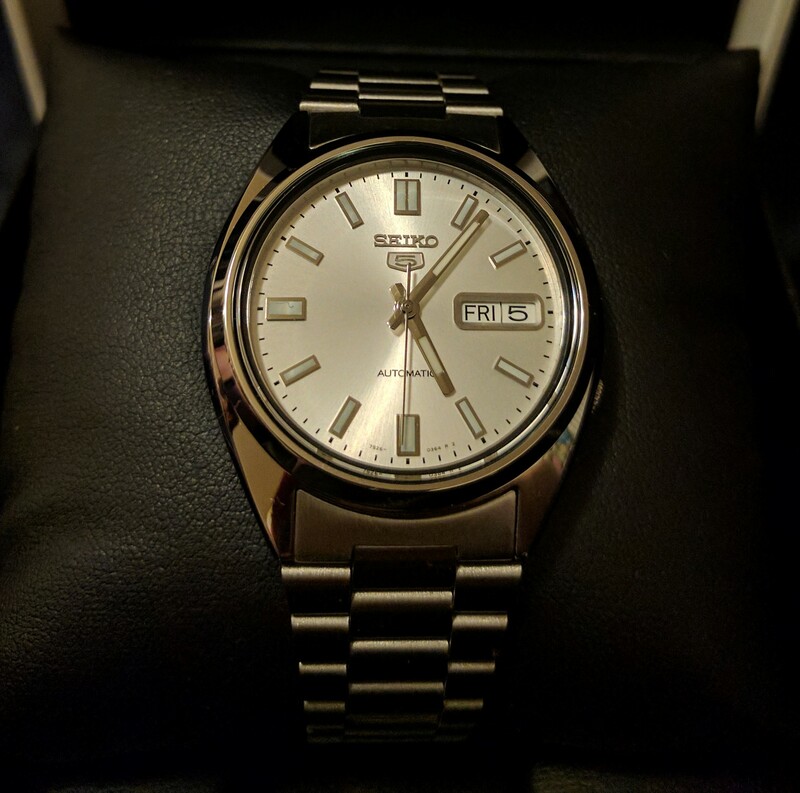 About six months ago, I started to look at the range of SEIKO watches and this one was about the closest match to my original watch, so when my 65th birthday arrived last month, I decided to treat myself to this SEIKO watch. It is very close to the original and I love it to bits, it has not been off my wrist since it arrived - it is as if an old, dearly loved friend has returned home at long last. The crown is offset on this model and the clear back was a novel surprise, but everything else is as I remember it - the watch just looks right and never ceases to please. It was a classic design 40 years ago and it is still a classic design today - this watch would not look out of place anywhere and has the kind of classic good looks that will endure forever. I must admit to some trepidation waiting for this watch to arrive - sometimes it is a mistake to hanker after what you had enjoyed years before and some things do not live up to the memory - I have not been overjoyed for several years, but I was when this superb timepiece arrived and I smile each time I look at it. I just cannot fault it at all - it is the perfect mans watch AFAIAC and I am chuffed to bits. I did buy a CASIO digital watch at the same time, partly because a digital was another blast from the past and partly because it was a watch to wear if doing anything that might cause damage to my SEIKO. And with the passage of time, the self-winding and control mechanisms would appear to have been improved, as this one seems to be keeping perfect time whereas I could not say the same for my original on. A nice looking watch with a good feel around the wrist. The face is clear and easy to read, with the day changing to blue and red for the weekend. The see through reverse is also a feature for the wearer to see internal motion and the effect of the automatic movement to power the watch. All in all, a good quality brand with a well made watch and importantly at a very reasonable price. Very pleased with this watch, looks very stylish. Good value for money. Seiko is a very good make. It was very nice watch I give gift to someone they like very much I am very happy about that thanks sgen. . Very pleased with the watch, looks good and keeps excellent time. Perhaps you could include instructions with the watch and also for removing links to make the bracelet fit instead of having to pay a jeweller to do it. I am very happy with the watch and enjoy wearing it. My only criticism is that there were no instructions on how to work out the settings, and I had to ask a friend about it. Apart from that it is very good value. This watch is an ideal replacement for my previous watch. I like its elegant look, and value the silver bracelet and fitting. On top of these I am pleased that there is no need to change the battery. It keeps good time but this can be easily adjusted when required. One mystery. It beeps every hour, something I dont want and cant see how to eliminate.Help! I am very happy with my purchase a very nice looking watch.Also the fact that you are able to see the auto movement. the packaging was excellent. This watch is exceptional value, it is a smart gents dress watch with a silver dial, I have had an automatic spring driven watch before, but I really like this one. It looks really smart on the wrist, not like those oversized ones! It also has a nice partially hidden winder, easy to use, and will not get accidentally pulled out. Simple to adjust to the right size. Feels comfortable and keeping time well. Not bulky for a value automatic mechanism. Good to have the window into the mechanism on the back. It arrived when promised in very upmarket packaging. The set up process was a bit fiddley and I still cannot change the calendar from French to English. It was exactly what I was expecting in terms of looks and has lost about 1 minute in the 2 weeks Ive had it. I have not worn a watch for a long time and wanted something simple, attractive and affordable. This Seiko 5 was a good fit. The watch is an automatic, which has the benefit of needing no battery changes. I read a little on the Internet regarding the movement in this watch a Seiko 7S26 movement. It was described as a little workhorse which captured energy from the movement of the wrist well but that could gain or lose time more than other, more expensive movements. I wear the watch all day and take it off at night - it has not ever stopped. There is no winding facility on this watch in case the watch does stop, instead there is a rocking procedure that is explained in the watch manual. As regards accuracy, in the last two weeks, the watch has gained two minutes or about 9 seconds a day. My partner tells me thats an accuracy of 99.99% which is pretty good for a watch of this price. The watch has a bilingual day and date function, with the second language being French. The crown in the first position sets the date in one direction and the day in the other. The second position sets the time. The second hand keeps moving whilst the time is set so if this will bother you or not setting it is easier if it keeps moving bear that in mind. 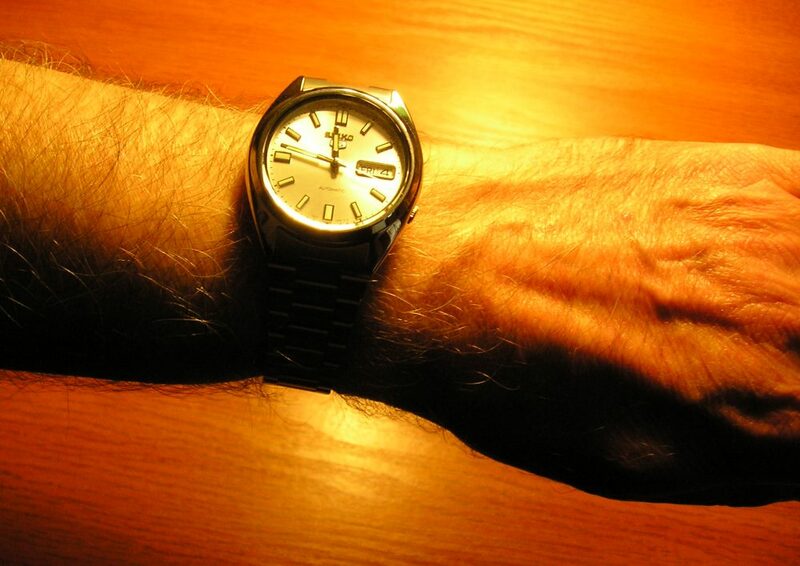 The second hand moves more fluidly than a quartz watch second hand. From a distance it looks continuous, which is pretty swish, but up close you can tell that the second hand moves once every 1/6th of a second. The tick is very quiet but audible up close. I keep it on the bedside table about 30cm from my head and cannot hear it one bit. There is a nice glass back which allows you to look into the mechanism which to the unindoctrinated watch owner looks pretty cool. The watch does not feel heavy when worn on the wrist all day and after a while you start to feel the weight that charges the spring in the watch moving. You can feel the watch charging! The watch is entirely silver coloured which I think is nice for a day-to-day watch. The wrist band is a matte silver compared to the watch face and body. I have a fairly large but not massive wrist and the watch bracelet was more than big enough for me. The clasp shuts tightly and is reassuring though the play between the links does feel a little disconcerting at times. On the plus side for the bracelet, I have fairly hairy arms as seen in the photo and this bracelet has not ever caught or pulled one of my arm hairs. The luminous sections of the dial are found on the minute and hour hands, and on each hour except three oclock. When the paint is charged the glow is very bright, but if kept out of direct sunlight or lamp light, the glow is pretty poor. Wearing it up a sleeve, or having a coat on as one often does in the UK will result in a very meagre glow. As I write this it is a very dull day and I would have to say I have no glow whatsoever. The watch comes in a decent cardboard display box sat around a cushion. There are no items in the box that could shift and scratch the watch in transit. All in all I like the watch very much. There may be one or two little problems with it, but I would not change any of them as they add to the character of what is a very nice, affordable watch. I would recommend it to anyone who is looking for a solid everyday watch. So far, I love the watch. The strap is slightly slack, but not to worry me. Service, value, product and delivery. Have other Seiko watches and Seiko have never disappointed me or let me down. This Seiko was for myself, and I am very pleased with it. I have several other Seiko watches none of which have ever let me down, No doubt I will get others in due course. I believe it is one of the most reliable makes of watch. Fantastic value for money, the finish and classic retro look is excellent. Ive owned automatic watches that cost 50 times more and they are definitely not 50 times better. Bought this watch as a temporary time piece, whilst deciding whether it is worth £400 + to get my regular watch serviced - my heart says yes but my mind says not worth it when you see what £60 can get you. The see through back cover is a nice touch. Taking links out of the metal strap can be tricky but managed it myself - you will need a small flat screw driver, a small braddle and a little controlled brute force to get the link pins out. A very good looking watch. Looks more expensive than it cost. Very easy to read. Good time keeping and having the day and date is a bonus. Much lighter than previous Seiko watch. The crown/ button could be a bit bigger. Having not to replace battery because its automatic is excellent. Great product, bought as a gift for my Dad. Pleased with the watch, the price and the speedy delivery. 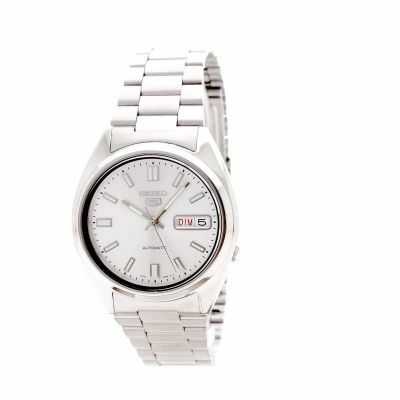 Watch is silver coloured with good clear face and date display. It works from movement. It has an easily adjustable bracelet. A timeless classic from Seiko, Christmas present for my dad. Fantastic quality and value for money. High St retailers selling for double what I paid. Clear clock face that glows in the dark, silent and no need for a battery. Watch stores energy from movement to keep it ticking. Should last a lifetime. Wow, if Id known that Id be getting my money back for simply submitting this review I would have bought a more expensive watch. Saying that this is a fantastic everyday timepiece, very smart and as someone else stated, very unpretentious. Im very happy and will probably come back for the gold one as well. The Watch Shop like you to review the product and not the service but Im going to say that I think they have a top class business here. Ive been very impressed with the painless and very swift service and the high confidence that gives. The best and fastest service ever. We ordered at 3pm one day and received the item the following day. Cant fault you, we were kept informed throughout. Lovely clear watch, but just wondered if anyone has had a problem that this watch keeps stopping - particulary at night Ive tried lying it on its side at night which has helped a little - I will contact watch shop about it but just wondered if anyone else has had this problem?? This watch has nice classy look, but not too lavish. I very much like the automatic mechanism, which takes away the bother of having to wind it up or change batteries when they run out. I bought the watch as a gift for my dad. It arrived very promptly as promised and looked better that in the picture. My dad loved it at first sight and is very happy with the way it works. It is truly a great classic piece for everyday wear! Definitely worth the cost.Will surely recommend it!! This is a really GREAT watch - looks good - superb build quality - great time-keeper........a really good starter/every-day automatic watch - HIGHY RECOMMENDED - and great service too from watchshop! and no batteries to worry about. there is nothing that I dislike about this watch. The watch was first class, i am very pleased with it. I was very impressed with the service provided by your goodselves. The next day delivery was superb. What can you say about the classic that is the Seiko 5, lovely little watch, I say little as it sits a little small on the wrist. also the bracelet, is not the best out there, having owned and still own more expensive watches, it feels very cheap, and that is because it is. but put this watch on a Hirsch leather strap and it comes to life, many people have commented on this now, also a friend ordered one for her dad when she seen it. fantastic bought for a present person who recived it very pleased it is stylish and perfect for everyday, evening wear. The watch look good. The color is classical,and the size is suitable and what is more, it is automatic watch. Considering its price, it really deserved. I was looking to replace my old watch after the battery didnt last more than a few months . I decided to look around for an automatic watch that didnt need batteries, after searching the Internet I came across the seiko 5 SNXS73 . After reading the reviews I took the plunge and ordered the watch from The Watch Shop. The watch arrived the next day ! Packaged very well . It is all I hoped it would be . Great looking watch , easy to read day & date . Luminous hands & hour markings . Looks a lot more expensive than it was. Keeps perfect time . Would recommend to anyone . I already own a “few” watches, ranging from older Mechanical to extremely accurate modern Quartz. However, bored with wearing a different watch every day, I have been looking for a modern automatic, precision, luminous, robust, an everyday wristwatch. I have often said that although the USA “invented” Quality Assurance, the Japanese “perfected” the technology --- as shown in the reliability of modern commodities. My own opinion, of course! I have a Lorus chronograph which I believe is from the Seiko stables, so I was looking for a Seiko. WatchShop’s reviews on this watch were 5/5, 21 of them: AND 4 styles to choose from! 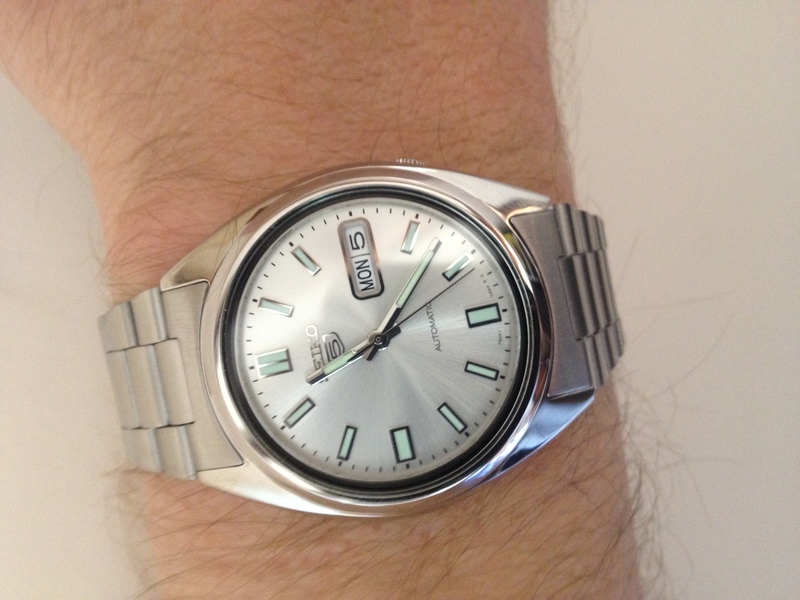 I ordered the Seiko 5 Automatic on the Friday night, and it arrived over a w/e Monday midday. It was promised by Tuesday! I have worn my Seiko now, day and night, for almost two weeks. It does “what it says on the packet” and I am absolutely thrilled and delighted with my purchase! I am happy to recommend not only the watch, but also the Service from Watchshop. 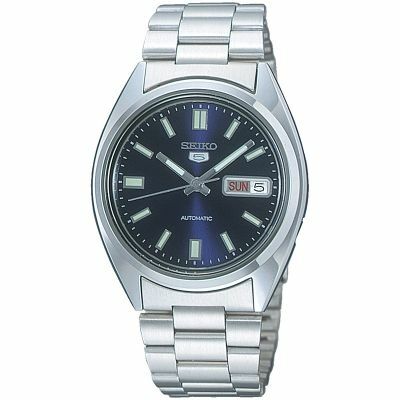 Mens Seiko 5 Automatic Watch SNXS73 is an excellent watch. The qulity and finishing is good . Exactly the watch i wanted very similar to a Seiko 5 Auto I had in the 80s. The style is classic Seiko 5. Clean lines, simple classic looks and keeps time well. The day date digits are just the right size and clear to read. The dial has illuminated bars at 5 minutes interval so there is no clutter and they illuminate through the night without being over bright. The steel bracelet is a good size and fits my 21cm wrist at max setting. All in all very pleased indeed with the performance, look, price and finish of this classic watch. If you are looking for a watch that will not age with changing fashion I would try it before it is gone as i think stock is limited. My dad loved the watches I bought from you - he is a happy man which is ironic as his nickname is Grumpy. very good looking watch, nice sweep second hand motion, looks more expensive that it was, little disappointed that the catch is not push button deployment. I would say the fit is a little on the small side aswell. But overall a very good watch for he price. Service was also excellent with very fast delivery. This was bought to replace a 30-odd year old version of the same watch which was getting a bit long in the tooth . I like the day function which not many watches seem to have. I also liked getting a comment on the first day I wore it that it looked a bit like a Rolex - even though I have no aspirations towards anything that high-end! GREAT WATCH. VERY GOOD PRICE. QUICK DELIVERY. WHAT MORE CAN I SAY. THIS IS MY 4TH WATCH FROM HERE. Early days yet only had it about a month but good time keeping and clear day, date and second hand. The seeming high amount of luminosity is not clear as expected. But it is a neat unpretentious little watch and if it lasts was good value. The watch works very well. It arrived exactly as predicted and I am very pleased with the product and with the service I have received. Very nice looking watch, not to large and clumsy looking. Extremely satisfied. Not started to wear the watch yet because its for my husbands Christmas present. I have shown him and he likes it. I had to buy this model again as I gave it earlier to a relative a keepsake. Missing it now in my later years I decided to remind myself of the pleasure I had had from this series 5 timepiece in the 1970s. watch and has a very quiet movement. I strongly urge the purchase of this beautiful watch whilst the opportunity exists. This watch is a re-issue of one of the original 1960s vintage Seikos. I think that it does have a nice classic look to it that would fit in anywhere. 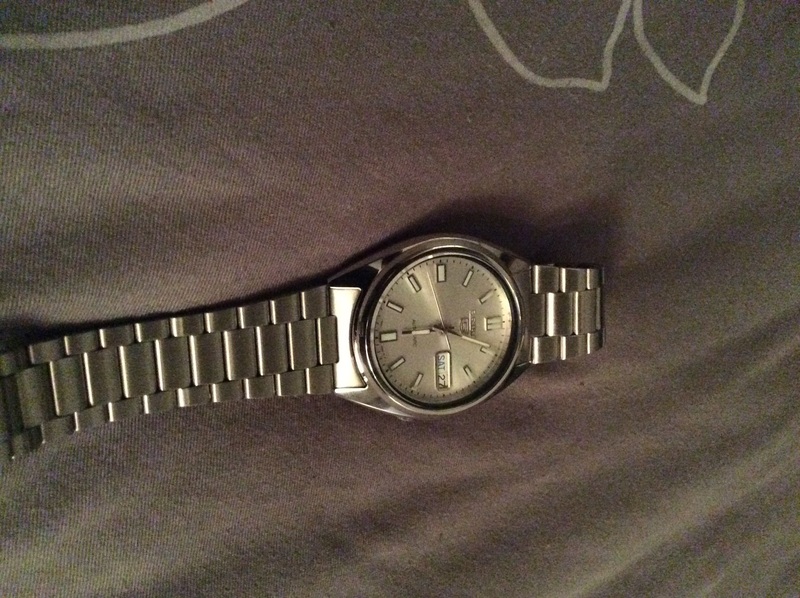 The watch itself is fairly typical of the Seiko 5 line. It is 38mm in size including the crown, uses an 18mm bracelet, has a strong looking stainless steel case and uses Seikos Hardlex mineral glass crystals for both the face and display back. The face is clean and legible. Everything is sized well, spaced well, printed nicely… It is an easy watch to read at a glance. There are silver printed markers on the dial at each five minute mark, with insert Lume and silver hash marks between the numbers. A larger applied silver hour marker is found at the 6, 9 and 12 positions, with inset Lume. 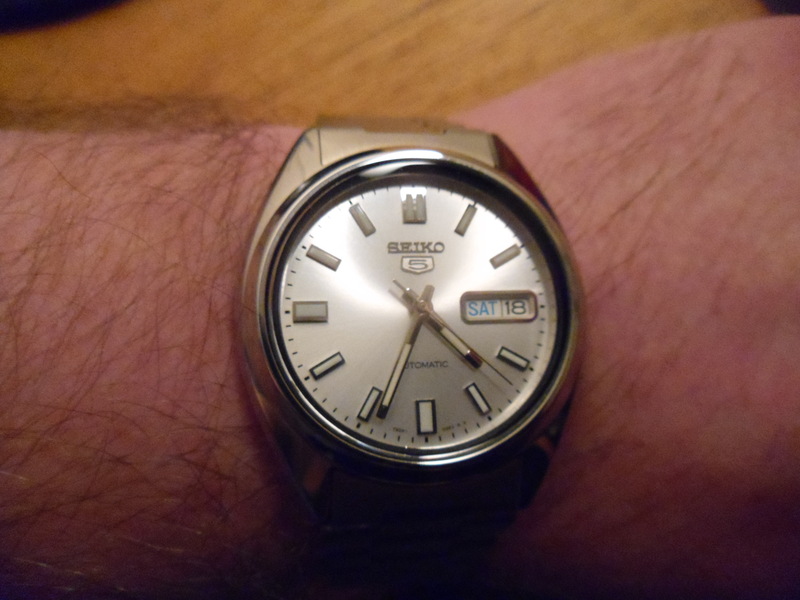 The Seiko name appears at the top of the dial, with an applied ‘5’ logo. At the six position, the word ‘automatic’ appear on the dial. The dial is capped with a flat Seiko ‘Hardlex’ mineral crystal. Hardlex is apparently Seikos improved version of mineral glass, supposedly more scratch resistant but not as much so as the sapphire crystals used in high end watches. The minute and hour hands are silver and infilled with Seiko’s Lumibrite luminous material. Lume quality is very good, as is to be expected with Lumibrite. The day/date window is framed with a silver bezel, with the wheels being black on white for a cooler look. The day wheel is bilingual. The watch is marked water resistant but no depth rating is given I have read conflicting accounts of Seikos without depth ratings as being either thirty or fifty meters water resistant. In the absence of a clear water resistance guide, I am treating this watch carefully by not immersing it for any length of time where possible. As I mentioned, this watch has a display back, a nice feature that allows viewing of the movement. The movement itself has a plain, industrial look about it, but it is still interesting to see. Otherwise, the watch is quite basic although it does show both the day and date. 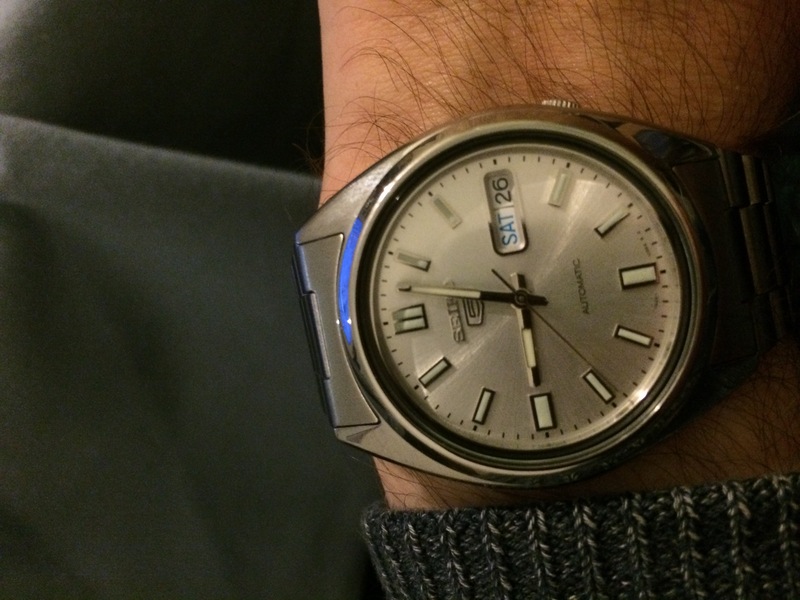 In the final analysis, there is nothing truly exceptional about the Seiko 5. To a great degree I think that is the point of this line. It is not meant as a technology or style showcase but instead as a hard working daily-wear timepiece. As such, it does have certain limitations. First off, The Seiko 5 line can neither be hacked or hand wound. If you are the type of person who likes to set your watches to exact nuclear time and measure their accuracy, the Seiko 5 isn’t for you. Similarly, if hand winding is important, as opposed to letting the automatic winder do its work as you wear the watch, look elsewhere. If you are seeking a good watch, and don’t ever want to deal with the hassle of changing batteries, a Seiko 5 is a fine choice. It is well made, good looking, and reasonably accurate as mechanical watches go. The movement in the Seiko 5 known as the 7S26 will run with no maintenance at all for as long as twenty years. Most automatic watches need cleaning and lubrication every few years to operate properly. That the Seiko 5 can go potentially for decades without a care is just icing on the cake, so to speak. I was pleasantly surprised when this watch arrived very promptly from the watch shop.. It is much nicer in look and feel than the pictures online show.. I wanted a watch to wear for work and this fits the bill perfectly. The face is simple and easily readable with an almost smooth second hand sweep, the strap is lightweight and comfortable and the overall look is stylish with an understated elegance. At £59.99 sale price it was also very good value. My last Seiko watch lasted 16 years with no problems and only only stopped working after a fairly serious DIY accident!!! I hope this one performs as well as the last. I am overall very pleased with my purchase. When it finally came this is not to say it was delivered late, on the contrary I must commend watchshop for just in time delivery, it looked really light weight and felt cheap. You see, the mastery in craftmanship of this watch takes time to get to you. If you get round buying it, dont regret it, its a good watch. this watch is a great value for money. but you need to replace the bracelet which i did. i got myself a thin black leather one and the watch now looks fabulous. apart from poor bracelet this watch is fantastic. it looks great and much more expensive than it is. reminds me of rolex airking. higly reccomend. mart and slim it tells the time. 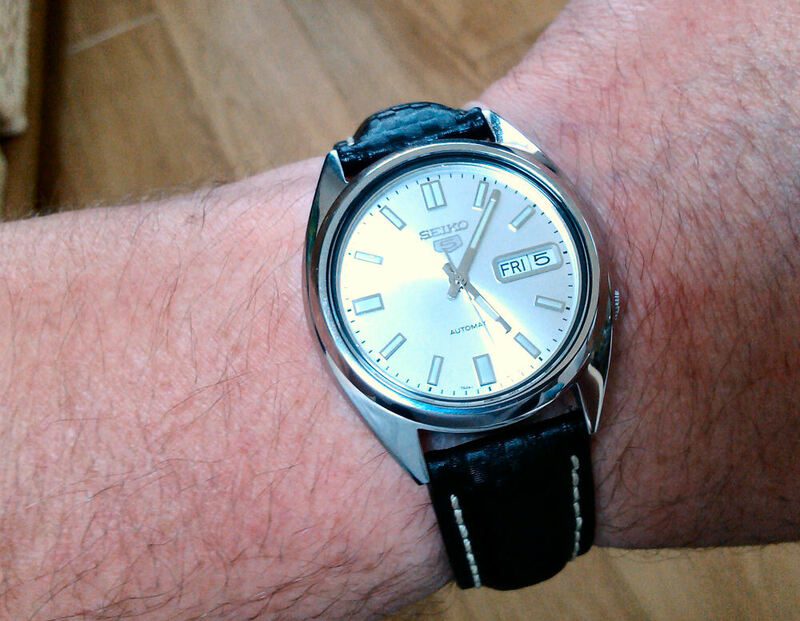 I was delighted with my Seiko 5 Automatic Watch. The ulta clear dial with luminous hour settings and exceedingly smooth second hand sweep puts it in a class apart from other watches. 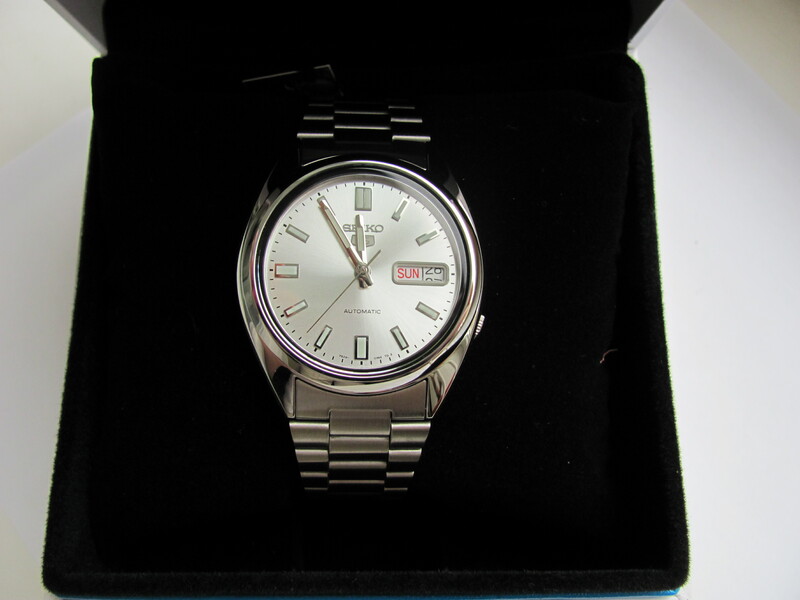 This, together with the efficient way that the watch was despatched, Watch Sop is to be congratulated. I will certainly recommend my friends.